Thank you! Just in time for strawberry shortcake! This is such a sweet design. Thank you very much. Please vote for the Cute Giraffe letter "O" as it's the only one I need for that alphabet. Thank you. Thanks for this cute design. Thank you very much for sharing,it's very nice. mignon petit cuisinier, merci beaucoup ! This design would be so perfect for a birthday "card" or mini wall hanging or some such thing...or any celebration where a cake would be in order, such as anniversary, etc. Thank you! This is such a lovely and cute design, thank you very much. Susie. Thank you for this cute design. such a cute design. thanks! subito in cucina con il mio gatto! Oh so very cute! Thanks so much. What a wonderful design for kitchen towels. Thank you very much. THIS IS CUTE I THINK I WILL USE IT ON A BIRTHDAY CARD THANK YOU. Such a cute baker kitty...THANK YOU!!! Thankyou so much. How cute is he!! Thank you and what a cute cat, very cute, love it. Lovely. Perfect for a birthday card. Thank you. Very cute and thank you! How cute! You do such a beautiful job - remember everyone - click an advertising link to help reward Cute Embroidery! It's so cute, thank you for sharing. Cute, cute, cute.....this kitty is precious....I wish I could teach my cats to bake (yeah like that's going to happen says my oldest cat)....thanks so very much. What a cute kitty!!! Thank you! I love this kitty!! Cute - cute! Thank you for sharing this this great design. this is so cute thank you. my mamma cat just had 4 kittens and i bet she would like to bake them a cake and get so rest!!!!! oh how lovely, thank you!!! Ahhhhh, she's such a cute kitty!! and she's pushing a favorite yummy. Thank you so much!! So great for a Happy Birthday Shirt ! Thank you so much for this very cute design! I love it! I love all of the designs that I get and this one is just as cute thank you so much. How precious! 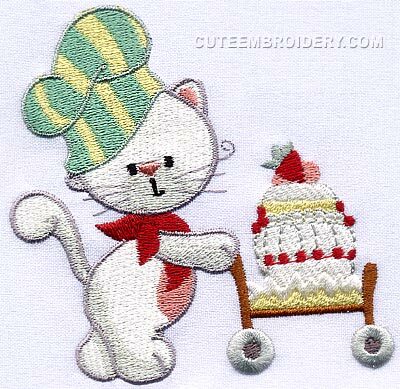 And, just PURRRFECT for something for my granddaughter's 1st Birthday coming up on August 4th! Thanks! Is there a new one coming up today or is this one going to run a couple days? really cute, thank you !! This is precious! I love him and I thank you. So cute nd I don't like cats! Oh, how adoreable....she baked a cake!